The Greenfield Fire District provides a variety of emergency services in Greenfield NY and the surrounding towns and cities, as well as safety training and fire protection to the residents of the fire district. This page highlights the many services our volunteers spend numerous training hours perfecting to serve our residents. The services listed below are not listed in any particular order. Obviously one of the main services the Greenfield Fire District provides is fire protection for its residents – that is, if someone’s house/business/car/property catches on fire, we come and extinguish it. To become an “interior classified” firefighter (permitted to wear an SCBA and enter a burning building), volunteers with our fire district are required to take a mandated NYS Firefighter course which lasts 13 weeks. Volunteers are also expected to qualify annually on district training mandates to ensure that their skill sets are adequately maintained. Arguably one of the most valuable services the fire district provides to its residents is EMS First Response. The fire district is dispatched alongside ambulances to medical emergencies in our fire district – which is a huge benefit to our community. The Town of Greenfield currently contracts with Wilton Emergency Services, Community Ambulance and Corinth Ambulance Corps to cover the majority of the town’s residents. The more remote sectors of the Town of Greenfield can take ambulance crews 15+ minutes to arrive to the location whereas fire district personnel can arrive in a fraction of that time. The district has many Emergency Medical Technicans (EMTs) and Certified First Responders (CFRs) who are trained to provide Basic Life Support (BLS) services to our community. Volunteers who become EMTs are required to take a 120+ hour course through the New York State Department of Heath to become certified. In addition to the course, EMTs/CFRs have annual training requirements as members of the Greenfield Fire District they are expected to meet. With nearly five miles of highway (I-87), five lane highways (Route 50) and windy roads, Greenfield Fire District volunteers are routinely called to motor vehicle accidents. Greenfield Fire District volunteers train regularly with specially designed tools used to cut (extricate) victims trapped inside their vehicle as a result of a motor vehicle accident. These tools are commonly referred to as the “Jaws of Life.” This is highly specialized training that requires hours upon hours of instruction especially to keep up with the assortment of vehicle technologies developed by car manufacturers such as hybrid vehicles and alternative fuels – each of which present unique and changing dangers to rescue personnel during accidents. Hazardous Materials is the generic phrase that refers to dangerous materials (typically chemicals) that can be found in our community. When there is an emergency that involves these materials, fire district volunteers are dispatched to deal with the emergency and protect our community. 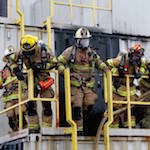 HAZMAT training requires a variety annual certifications. Some of our volunteers also have advanced training placing them on the Saratoga County Hazmat Response Team. Arguably the service we are most proud of is our Fire Prevention educational program. Each year, the Greenfield Fire District volunteers work alongside the Greenfield Elementary and Dorothy Nolan Elementary Schools during Fire Prevention Month (October). The district has a great working relationship with both schools and their principals which enable the program to be such a great success. The Greenfield Elementary school students are bused into the Greenfield Center firehouse where members from the Greenfield Center, Middle Grove and Porter Corners fire companies provide a lengthy fire prevention instructional program. Members from the Maple Avenue fire company visit the Dorothy Nolan Elementary School where students from all grades come to the auditorium where they receive fire prevention instruction. Our volunteers often take un-paid time off from work or personal vacation time to ensure the kids receive great instruction and ensure the program is a success. This program is routinely documented in local media such as this Capital News 9 story. The Town of Greenfield has a very large amount of wooded areas which include a variety of trails ranging from hiking trails, nature preserves, snowmobile trails and mountain bike trails. It is fairly common that our volunteers are called to rescue a person from the woods who has become sickened with illness, injured (from mountain biking for example), or otherwise not able to get out of a remote area (for example, a wooded area). In such a case, our volunteers are equipped with off-road rescue equipment including the recently purchased ARGO, that can go into the wooded area and transport the person to safety. This equipment also contains medical supplies to treat any medical situation the patient may have. This equipment is housed in the Porter Corners fire company. Sometimes people get lost in the woods – not necessarily due to injury or illness, but from misjudging darkness, or getting confused with trail markers. Many of our volunteers are Wildland Search and Rescue certified so they can work alongside New York State Rangers in searching for lost people. Want to Find Out More!? Send us a question via our contact page and ask us about how we continue to serve our community!